CAMBRIDGE — Call it a karmic rebalancing: Three years ago, while “The Book of Mormon” was prompting near-universal praise (and an ongoing box office bonanza) with its “satirical” take on the poverty and ignorance afflicting Uganda, two young musical-theater aficionados, Matt Gould and Griffin Matthews, were tinkering with a very different treatment. 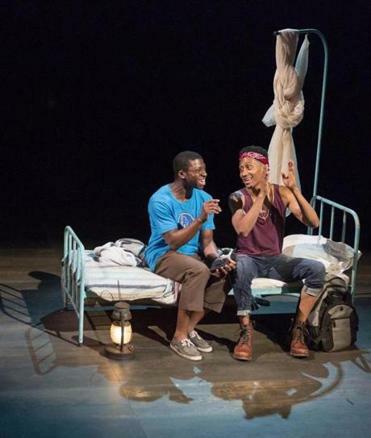 The long overdue corrective has burst forth at the American Repertory Theater in the form of “Witness Uganda,” a joyous, wrenching experience drawn from life. In 2005, fresh out of conservatory (the prestigious Carnegie Mellon) and at loose ends amid the aspiring-actor scene in New York City, Matthews — who here plays himself with offhanded charm — set out on a whim to engage in relief work in Africa. Adding to his disillusionment was the fact that he’d been dismissed from his church choir for homosexuality. “Imagine, a gay in the tenor section!” Griffin remarks to his sympathetic best friend Ryan (Emma Hunton), herself an aspiring singer-songwriter with body-image issues. The script — which Matthews co-wrote with composer/partner Matt Gould, who had done similar work in Mauritania — skips lightly, jokily, through the preliminaries, all the better to work up to an emotional chokehold once Griffin wises up to the sham nature of the charity for which he has signed on. It appears that the mastermind, one Pastor Jim (never seen but ominously real), is busy “building schools” all right, but only in the bricks-and-mortar sense: once the do-gooder tourists have done their stint and headed home, what’s left behind is lucrative real estate. Griffin gets the lowdown after befriending Jacob (Michael Luwoye), a young errand-boy who’s virtually an indentured servant within the volunteers’ compound. Jacob — whom Luwoye portrays from the start with a surfeit of brow-beaten servility, too much of a tell — labors under the watchful eye of the seemingly misnamed Joy (marvelous Adeola Role), a martinet whose motives will take some time to untangle. 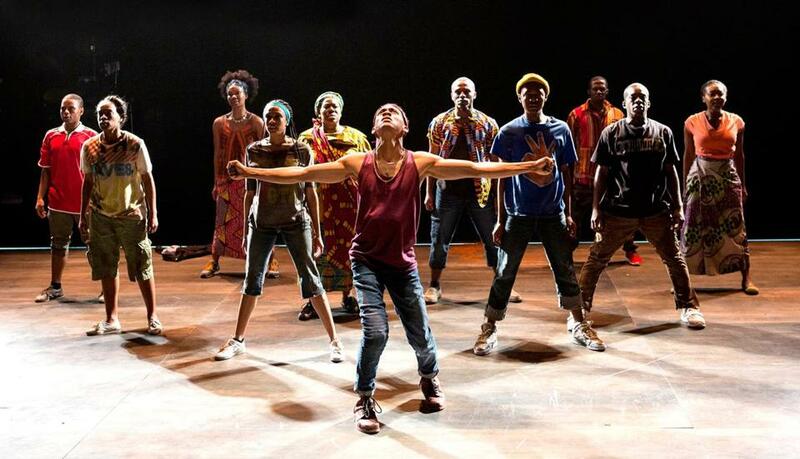 The design team convened by director Diane Paulus has done a brilliant job of conjuring, in minimal but sure strokes, the atmosphere of Africa, from hectic markets to hilltop vistas. Best of all, choreographer Darrell Grand Moultrie provides, from the very outset, an overflowing supply of ecstatic movement. These rousing dance breaks prove a perfect complement to Gould’s richly layered music, which ranges from street calls (Gould himself, at the keyboard) to a killer gospel choir. Keep an eye (you won’t be able to help it) on ensemble member Melody Betts, who bounces through several numbers giving knowing looks and emitting the occasional percussive “hah!” Someone’s bound to climb the heights of “Be the Light” and once there, wow, does she ever rip it up. This is just one of many moments when you’re apt to find tears springing to your eyes. The others are harder to chart or anticipate. Perhaps because Gould and Matthews don’t play up the pathos — they’re just telling a true story, honestly and artfully — it’s all the more overwhelming when it catches you unawares. Sandy MacDonald can be reached at sandy@sandymacdonald.com.